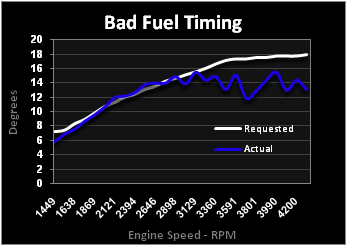 The fuel timing issue tends to deteriorate gradually (possibly over the course of several months) and drivers will not notice until the problem becomes severe. By logging we can do preventative maintenance at once. 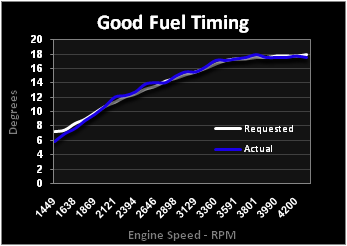 Optimal fuel timing contributes to better power and reduced emissions. 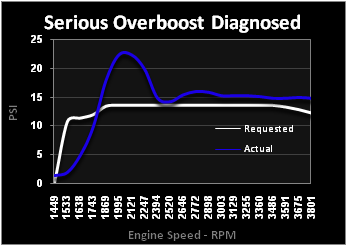 A similar case applies to the MAF sensor, which is another common deteriorating item in some engines. It slowly reduces power until it becomes weak enough for the driver to finally decide that something is wrong. This could be prevented early by logging. Logging also assists in fine-tuning boost control and other engine parameters during custom tuning. There’s an apparent improvement, but it’s still overboosting. 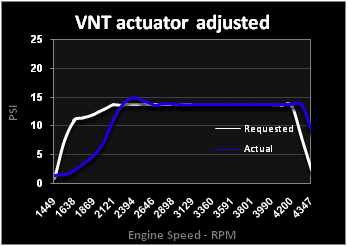 Engine logs revealed that the N75 duty cycle was a lot higher than normal so the turbo actuator was adjusted to factory specs. See the next chart for the result. His turbo was a 6-month old factory replacement with an incorrectly set actuator! Now his engine is optimized for longer turbo life and it’s ready for a great tune. 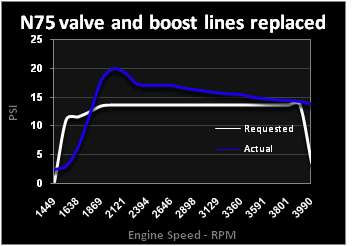 If minor overboost or underboost persists, they may be corrected in a custom tune. Without logging, these charts and diagnosis would not have been possible. What tool is used for logging? VCDS from Ross-Tech is the most popular tool for Volkswagen, Audi, and Porsche engines. Currently we are a Ross-Tech dealer. If you would like to buy this cable through us, please contact us for more information. Do you have a logging guide? Our logging guide can be found here.